Four New Discoveries in May & June 2014! 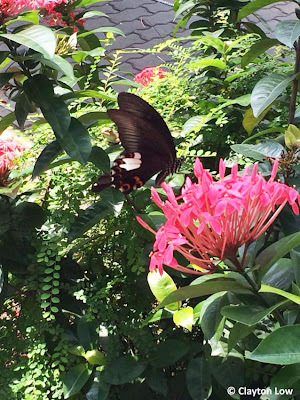 Over the past four to six weeks in the months of May and June 2014, Singapore's mainstream and social media was abuzz with the "invasion" of the Tropical Swallowtail Moth (Lyssa zampa) all over Singapore. 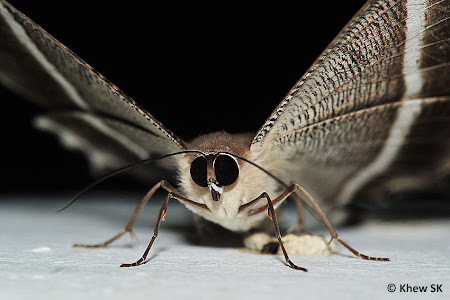 The large grey-and-white moth, started appearing in residential apartments, office buildings, shopping malls, multi-storey car parks and is too obvious to go unnoticed by all and sundry. There were comments that the appearance of these moths was a bad omen, and that unfortunate events will follow. These are usually common old wives' tales associated with moths and not surprising. 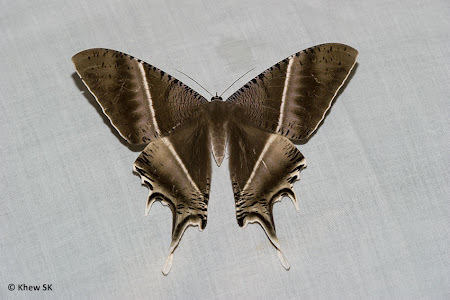 The media reports also featured interviews with ecologists and experts and I was also requested for my opinion on the sudden appearance of these large moths in Singapore. 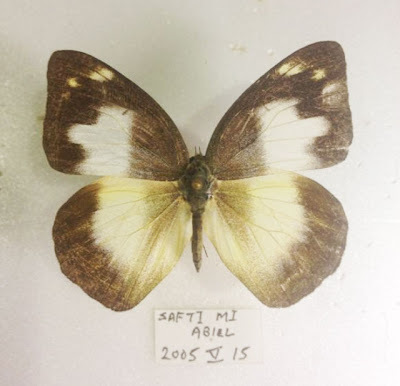 Amongst the many theories and postulations put forth by the experts ranged from the unusually dry weather in the first two months of 2014, the sudden flowering of many species of trees in Singapore and the reduced predation pressure on the caterpillars and adult moths that coincided with the end of the bird migratory season. Even as Singaporeans wondered about this moth, which continued to appear in numbers everywhere, the Malaysian news reported even larger numbers of the moths across the Causeway, with pictures of lighted buildings literally covered with hundreds of them! Whilst the moth made the news and piqued the curiosity of the public, butterfly enthusiasts in Singapore also had a lot of excitement with sightings of four new butterfly species over the past four to six weeks! 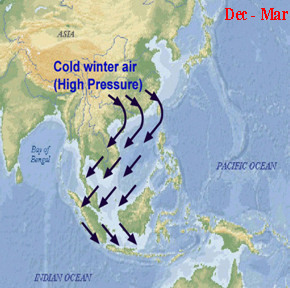 The months of April and May coincide with the end of the North East Monsoon months where light north easterly winds continue to blow from Malaysia towards Singapore. As these are months that also see the increase in butterfly numbers in Malaysia, the late north easterly winds could also have aided some of these butterflies in their journey southwards to Singapore. Coupled with the end of the bird migratory season, the reduced predation of butterflies and other sources of food by these birds, could also have been a plausible explanation for the ability for some butterflies to survive the journey across the Straits of Johor into Singapore without being eaten. 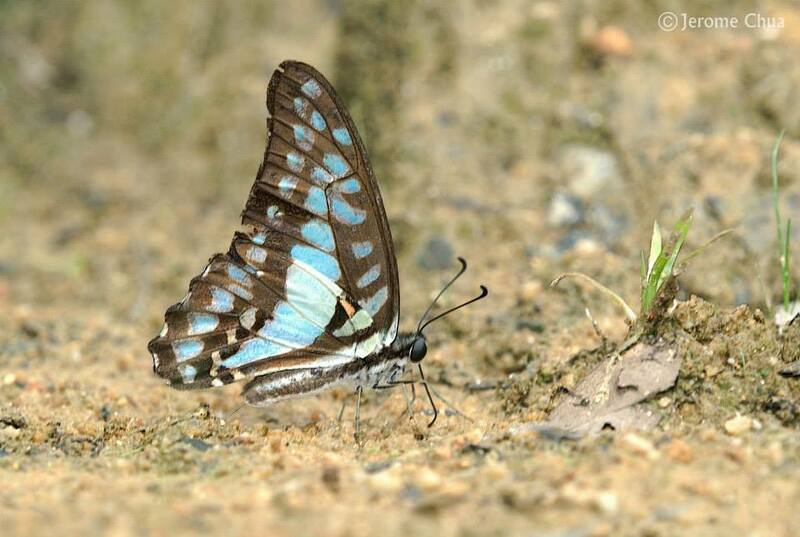 Starting with the most recent species spotted in early June, was the Striped Jay (Graphium bathycles bathycloides) by Tea Yi Kai. 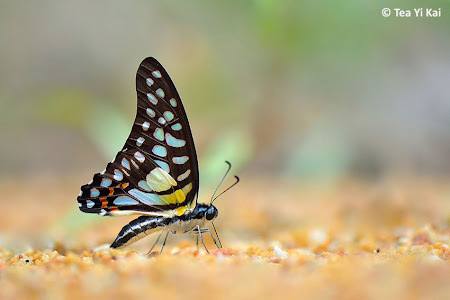 Whilst on a weekday outing in the Central Catchment Nature Reserves, he spotted this fast-flying Graphium puddling with a number of other Papilionidae. Although this was the first individual to be spotted and identified, Yi Kai also received news from a birder Stanley Feng that he shot another Striped Jay some time back in Oct 2010, after Yi Kai posted his discovery on social media. 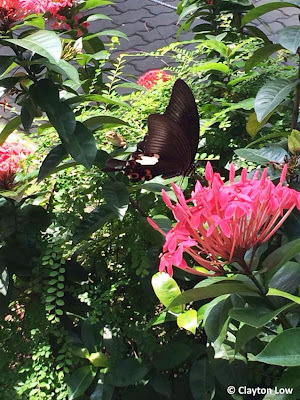 Nevertheless, we record this seasonal migratory species (or seasonal stray) as species #312 in the Singapore Butterfly Checklist. 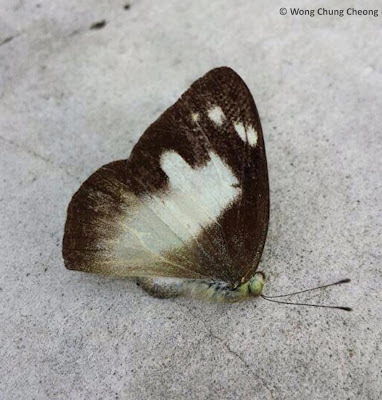 Thanks to Yi Kai for spotting and getting photographic evidence of this species in Singapore, and contributing his photos to ButterflyCircle. The Striped Jay is considered a seasonally common lowland species in Malaysia, and often photographed amongst large numbers of puddlers at sandy streambanks in the forested areas. 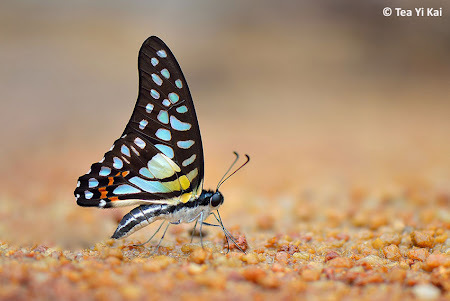 It is a fast-flyer like its other cousins in the Graphium genus and is certainly possible that it flew over from nearby Johor, aided by the winds. 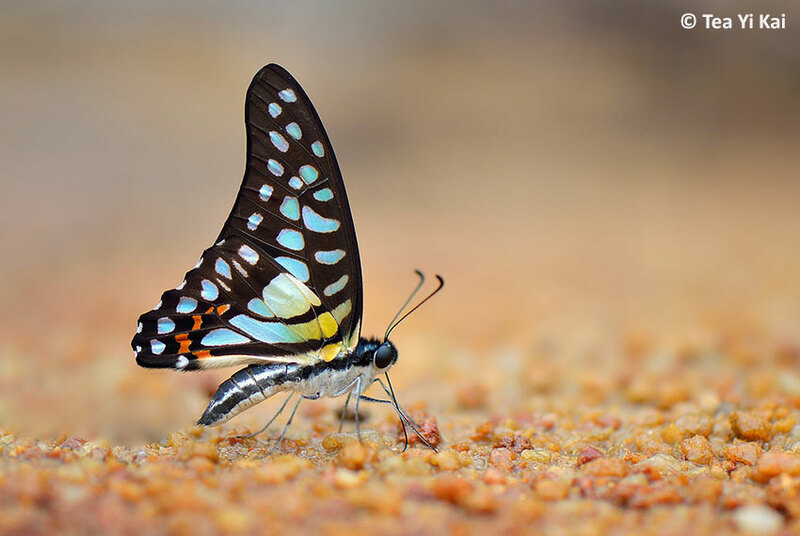 Just two days before Yi Kai's discovery, ButterflyCircle member Jerome Chua was also at almost the same location as Yi Kai in the Central Catchment and he photographed a tattered individual of another Graphium species. 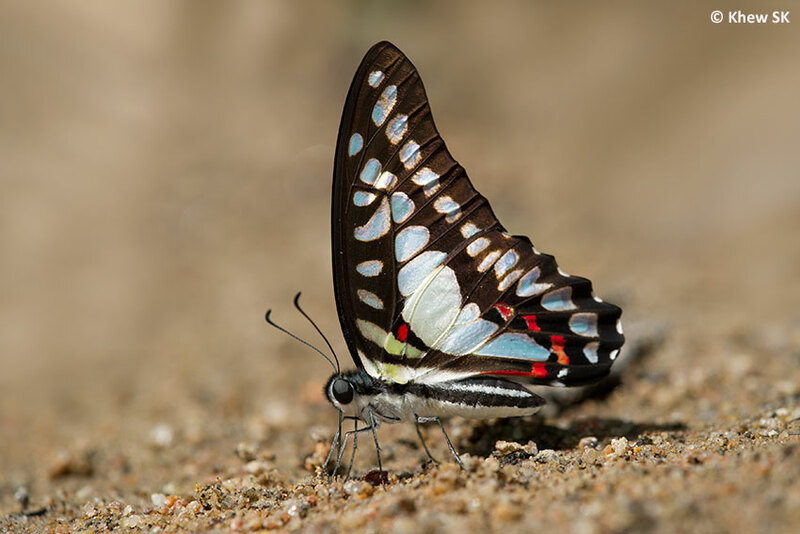 When he posted the photo, it was quickly validated as another of the "Jay" species - the Great Jay (Graphium euryplus mecisteus). Again, this species has never been recorded from Singapore before, and is now added to the Checklist as species #313. The Great Jay is relatively rarer than the Striped Jay, gauging from our own experience from trips to Endau Rompin National Park in central Johor in Malaysia, and other butterfly-rich areas further up north. 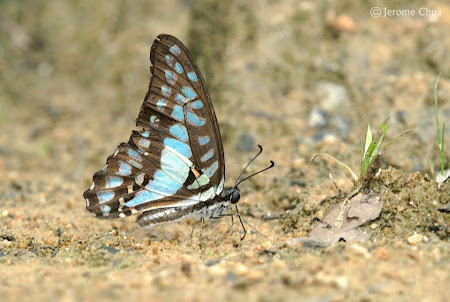 The Blue Jay (Graphium evemon eventus), Common Jay (Graphium doson evemonides) and Striped Jay tend to be more often photographed on these outings than the Great Jay. But it could be due to the seasonality of some of these closely related species. Equally as fast-flying as its other cousins, the Great Jay could also have flown here on its own steam, perhaps with a little bit of help from the north-easterly winds. Just around the time when Jerome discovered the Great Jay, another butterfly watcher, Clayton Low, was at the rather urban location of the National University of Singapore in the southern part of Singapore, when he spotted a large black swallowtail. 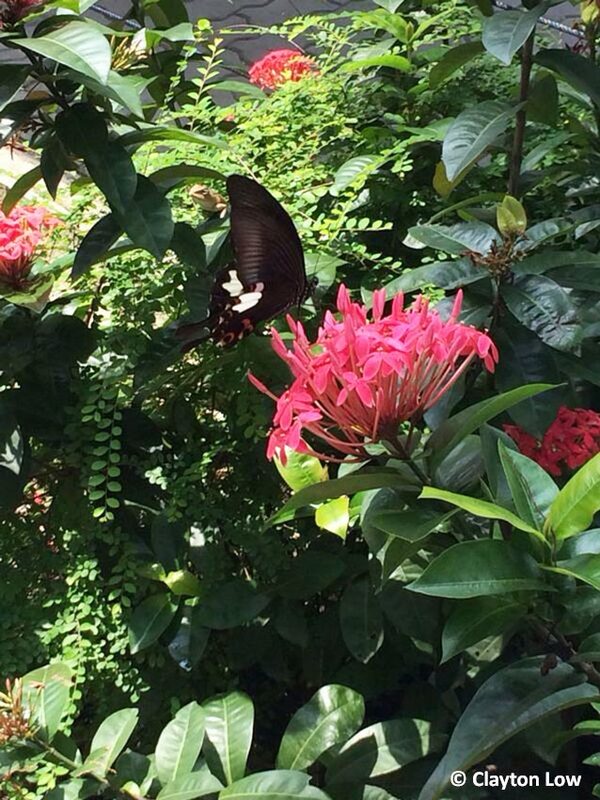 Using his mobile phone, the quick thinking Clayton managed to get three shots of the swallowtail when it was feeding on the flowers of the Ixora. Another surprise new discovery! This time, it was the Red Helen (Papilio helenus helenus), another species that was not in the checklists of the early authors. The Red Helen is closely related to the two extant species in Singapore - the Great Helen (Papilio iswara iswara) and the Blue Helen (Papilio prexaspes prexaspes). 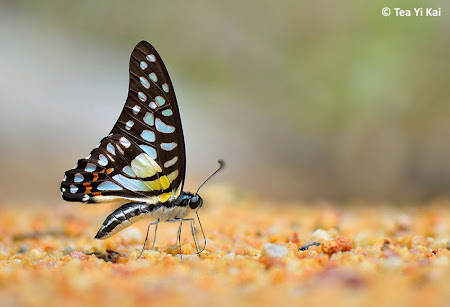 It is not rare in the lowlands in Malaysia, and outings amongst butterfly watchers often yielded many shots of this species puddling where more than five or six individuals are seen together. Thanks to Clayton for contributing his photos to be featured in this blog. 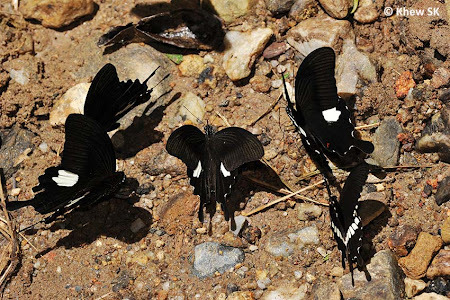 A group of puddling Papilionidae. How many Red Helens do you see? How this species managed to make it so far south, deep into Singapore, is another mystery. 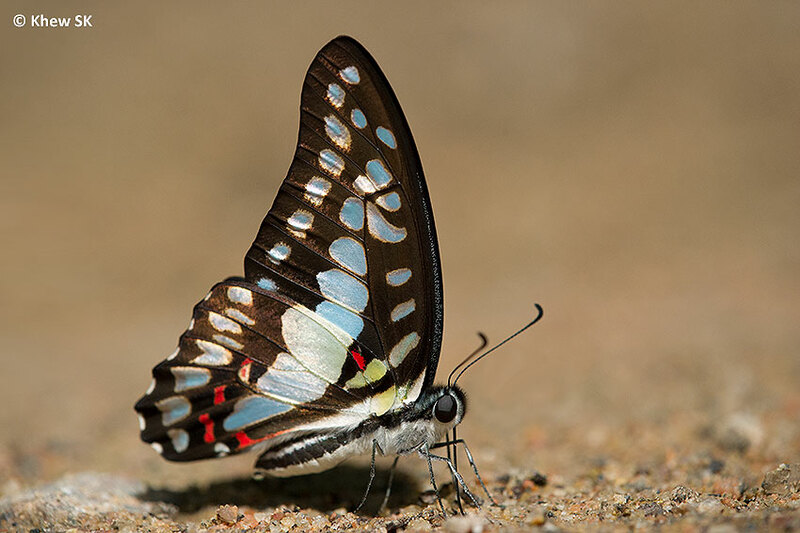 Clayton's photos of what he spotted showed a relatively pristine individual, minus the usual wear-and-tear of a butterfly that has survived a long migratory journey from up north. Could it be an escapee from the nearby Sentosa Butterfly Park, where the Red Helen is one of the species featured in the enclosure? Or this individual was just robust (and lucky!) enough to make the journey into Singapore from Malaysia without getting bashed up? Nevertheless, we record this as species #314 in the Singapore Checklist. Finally, Yong Yik Shih, a nature enthusiast, sent a photo of a dead butterfly to the ButterflyCircle chat group. It was shot by a bird photographer Wong Chung Cheong at the Rivervale area in Singapore. This was clearly a female Lesser Albatross (Appias paulina distanti), another new record for Singapore. 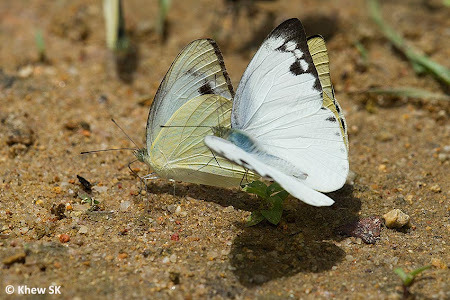 The Pieridae species are strong flyers and known for their migratory ability, and certain species like the Catopsilia spp. even bear the name "Emigrant" in their English Common Name! It is certainly possible that this female Lesser Albatross made it across the Causeway on her own steam but succumbed to either fatigue or even the venomous bite of a spider that ended her short life. Nevertheless, credit to Yik Shih and Chung Cheong for contributing their discovery to this blog, and we record this species as #315 in the Checklist. Upon noticing this discovery, veteran ButterflyCircle member Steven Neo reported that his son, Abiel Neo, captured another female Lesser Albatross many years back at SAFTI Military Institute in Jurong on the western side of Singapore. Abiel was serving his national service at SAFTI when he came across the stray female Lesser Albatross, and the specimen is labeled as found on 15 May 2005. Again, another sighting in the month of May! The Lesser Albatross is seasonally common in Malaysia, and we have encountered males of the species puddling in numbers at sandy streambanks in the forest. Coincidentally, in the past two months, there have been many sightings of the related Chocolate Albatross (Appias lyncida vasava) a recorded seasonal migrant to Singapore, ranging from Seletar Country Club to the nature reserves and all the way down south to Gardens by the Bay! A female Chocolate Albatross was even observed ovipositing on its caterpillar host plant in the Singapore Botanic Gardens. It would be great if these species are able to somehow breed in Singapore and become naturalised species rather than migratory strays. But we will never know for sure. 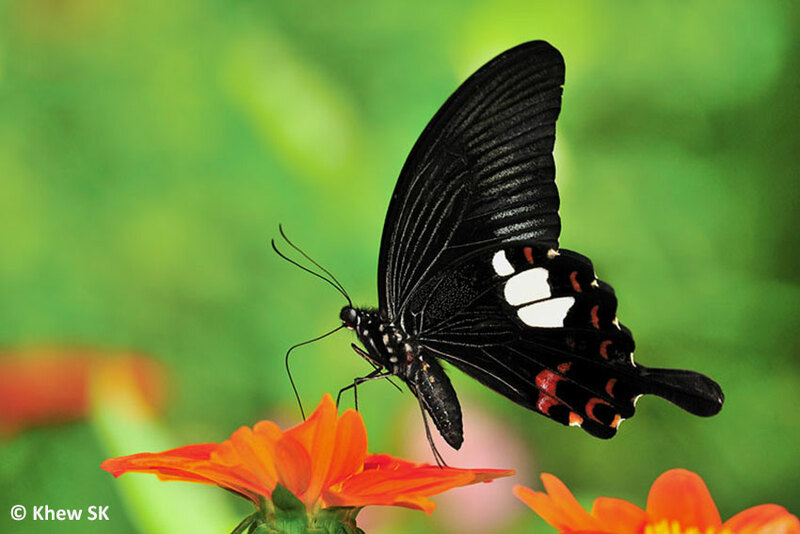 So do keep your eyes peeled for new butterflies coming across from our neighbouring countries. They certainly do not have to respect geographical and political boundaries like we humans do, and will come and go as they please, as long as the environment and habitats are conducive to their sustainable existence. Special thanks to Tea Yi Kai, Clayton Low, Yong Yik Shih and Wong Chung Cheong for sharing their finds with ButterflyCircle. 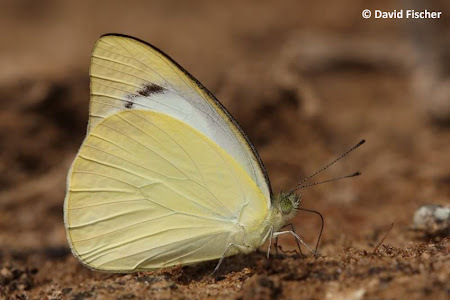 Special remarks on the English Common Names of the butterflies featured in this article : the names are taken from the literature cited above as they are more relevant to the butterflies of the South East Asian region. There are other references on the Internet, e.g. 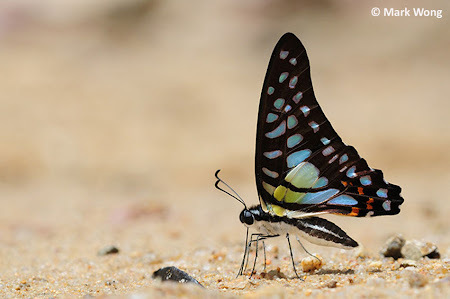 Wikipedia and other sources like the checklists of butterflies in North Asia and various Indian butterfly fauna literature which refer to these species by different common names. 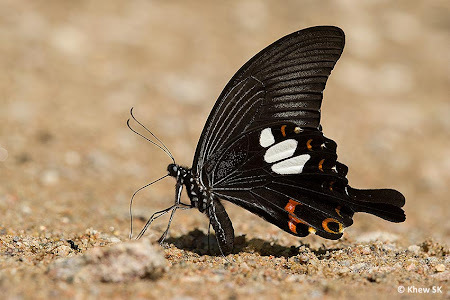 However, we maintain that reference to the books that are written by authors relevant to South East Asian butterflies would be more applicable and we choose to use the names quoted in these books for our local butterflies, where applicable.